I am proud to announce that the Lake Union Virtual Museum has been awarded a grant from 4Culture, a cultural services agency of King County. 4Culture is funded by the county’s lodging tax and supports a range of arts, cultural and historic preservation activities. Most 4Culture grants go to well-established organizations, so I wondered if they would even consider funding an individual effort like mine, and I didn’t expect much when I opened a letter from them in June. I was pleasantly surprised to read that while they were not granting the full amount I had requested, they had awarded $4,000 to my project. The fact that they recognized the value of my work to the local community meant more to me than the dollar amount of the grant, so I was delighted. This grant will help me add new exhibits to the Lake Union Virtual museum in the coming year. I have already begun work on the first of these by videotaping an extensive interview with Paula Becker of Historylink.org. Paula recently co-authored with Alan Stein a beautiful book entitled Alaska-Yukon-Pacific Exposition: Washington’s First World’s Fair, published in June by Historylink and available now in bookstores, Amazon.com and at Bartell Drugs, where I bought my copy. On a sunny morning in early July, Paula sat down with me in West Montlake Park and talked about Lake Union’s role in the AYPE, Seattle’s first world’s fair of 1909. Turning toward the University of Washington across Portage Bay, she painted vivid word pictures of the opposite shore a hundred years earlier, when it exploded with activity, music and fireworks all summer long, as part of the “Pay Streak” – the carnival side of the otherwise high-minded fair. A couple of hours later, strolling among the UW Medical Center buildings that now stand where the Paystreak was, we came to a boat rental place with dozens of people lined up to rent kayaks and canoes. In an impromptu interview on a dock there, Paula remarked that while the surroundings may have changed drastically in a hundred years, the festival atmosphere of people enjoying Lake Union on a summer day hasn’t changed a bit. My new exhibit on the Lake’s role in the AYPE will be online soon. The newest chapter of the Lake Union Virtual Museum tell the story of one the lake’s most charming features: it’s floating homes. Howard Droker, author of the definitive book on the subject, Seattle’s Unsinkable Houseboats, hosts a five and a half minute mini documentary video on the first page. Droker takes us back to the early years of the 20th century, when houseboats were far from being the romantic and expensive enclaves they are today. Unable to afford housing on land, Droker explains, many loggers, fishermen and itinerant workers lashed together rafts from floating logs and built shacks on top of them, using castoff materials from Seattle’s many lumber mills. During the two World Wars, when war work at Boeing and PACCAR brought thousands of workers to Seattle, houseboat colonies expanded and played vital roles in relieving housing shortages. As soon as shortages were over, however, the city did its best to eliminate what it saw as eyesores and communities too much on the fringe of society. At one time the shores of Lake Union, Lake Washington and the Duwamish River bristled with thousands of houseboats, but today only a few small colonies on Lake Union remain. Thanks to the work of a Communist newspaperman, who came out of retirement to organize the last of the houseboat community, floating homes survived the onslaughts of urban development to become proud symbols of Lake Union tradition, and among Seattle’s most cherished landmarks. Currently this chapter consists of two pages, but I will be adding more historical materials in the future. Take a nostalgic stroll down houseboat docks normally not accessible to the public by visting our latest chapter. 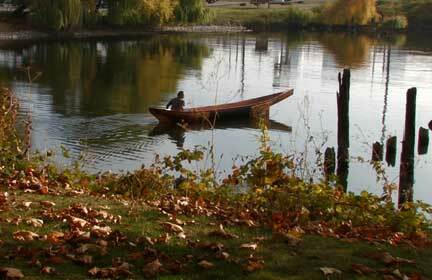 Thirteen pages are now online, with chapters about boat building, Gasworks Park and the Duwamish Tribe on Lake Union. A new chapter about houseboats will be coming soon. Please visit the site and leave a comment. On Wednesday night I was privileged to interview a lovely lady named Jacqueline Swanson, who had many fascinating things to say about being a Native American in the Pacific Northwest. 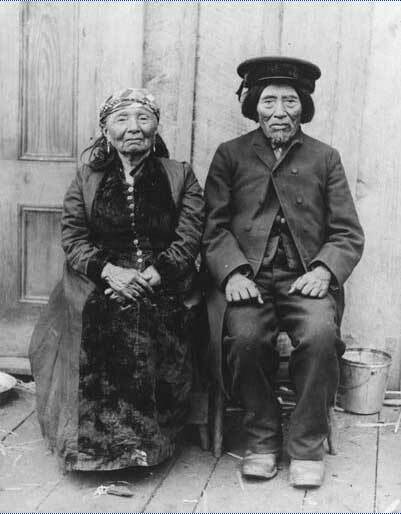 Jackie is a descendant of Cheshiahud, one of the very last Duwamish Indians to live on Lake Union in the late 19th and early 20th centuries. In an interview that lasted well over an hour, Jackie slowly unraveled the tale of how she learned about her family’s history and eventually discovered that one of Seattle’s most famous Natives, Cheshiahud, was among her ancestors. Jackie describes Cheshiahud as a survivor who figured out creative ways to remain near his ancestral lands when most of his tribe had been banished to reservations. Although another of her ancestors fought alongside Chief Leschi against White settlers in the Battle for Seattle in 1856, Jackie says she also proud of her ancestors who befriended settlers like David Denny and worked with them to build Seattle. Jackie affectionately recounts how she first stood with anthropologist Jay Miller at Cheshiahud’s grave in Evergreen-Washelli Cemetary. Cheshiahud was buried here – not far from the grave of a former Mayor – at David Denny’s insistence, despite the fact that Indians were not allowed burial in Seattle cemeteries until the 1960s. Jackie’s eyes glowed brightly as she described this example of friendship triumphing over prejudice. I am presently transcribing Jackie’s interview in preparation for producing a video about Cheshiahud to be featured in a new chapter of my Lake Union website. I need to gather additional footage for this video, so you can be sure I will be visiting Evergreen Cemetery soon. We all have moments (I hope) when we say, “This is what I live for!” For me, such a moment comes when I find myself fully in the presence of history; when all signs of the present day fade from my consciousness and I can imagine myself transported back in time. There is a comfortable feeling that comes with this; a feeling akin to deja vu, yet different: a feeling not that I have been here before, but someone, perhaps an ancestor of mine, has been here or had an experience like this, many years ago. I was lucky enough to have one of these moments today as I was videotaping a Native American woodcarver named Saduuts paddling a canoe on Lake Union (above). Saduuts paddled patiently back and forth as I scrambled along the shore with my camcorder and tripod, trying to frame him in ways resembling how early settlers in Seattle might have seen Cheshiahud and other Native Americans on the lake. Earlier in the afternoon, I interviewed Saduuts on tape as he worked on hewing an ocean-going canoe from an enormous log. I hope to use this interview and other footage of him in my website on Lake Union history. 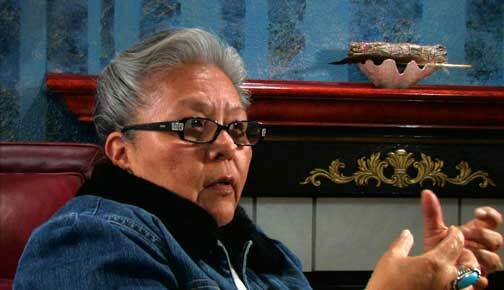 Videotaping with Saduuts was a big step toward bringing the Native American perspective to my website. My next step, if all goes well, will be to videotape one or more members of the Duwamish tribe. Saduuts is descended from the Haida, a tribe from Canada and the Alaska panhandle, so although he talked eagerly about canoes and wood carving, he deferred to the Duwamish on anything pertaining to local Native history. Also, Saduuts’ canoe is painted with traditional Haida family markings, so I realized that many of the shots I got today will not be appropriate for illustrating the story of the Duwamish on the lake. In other news, I spent an hour yesterday in the landscape architecture office of Richard Haag, scanning some of Richard’s personal slides of Gasworks Park. Richard is in Europe now, lecturing on “Trees in the City,” but he left his slides with an assistant, who kindly helped me scan them. Thanks to the wonderful cooperation of Richard and his staff, the chapter on the Gasworks will be the first page of my website to go online, just a few weeks from now! The last few weeks have been filled with meetings, phone calls and emails to set up video interviews and collect archival still photos. In between these, I’ve continued to wander around Lake Union, gathering more and more of the “wood” from which I’ll be shaping parts of my website: HD footage of the lake’s many activities. 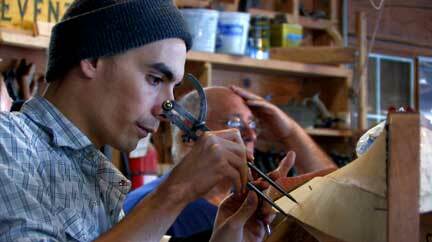 One day I wandered into the boat shop at the Center for Wooden Boats, where I found a group of men intensely making measurements on the skeleton of a boat they were building. 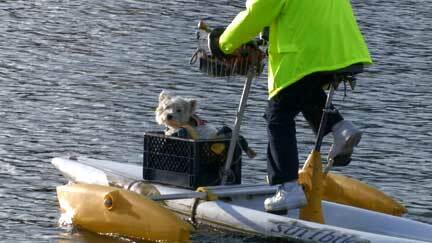 A few minutes later I spied a dog enjoying a leisurely cruise aboard a most unusual water craft: a floating bicycle. 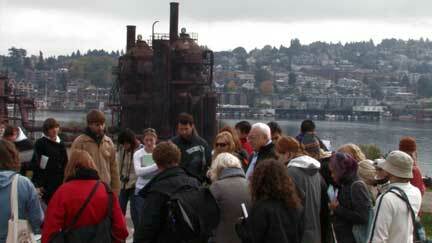 Today I spent an hour with Richard Haag as he led a group of UW Landscape Architecture students on a tour of Gasworks Park. It was wonderful to see how the students hung on Richard’s every word, busily scribbling notes as he interspersed technical advice with humorous anecdotes. After the tour, students asked me to take pictures of them posing with the world-famous landscape architect who designed this park. In the parking lot, Richard opened his trunk and loaned me the first of the artifacts I plan to feature in my Virtual Museum: small objects reproduced in large-scale photos, cut out from their backgrounds and placed on my pages with drop shadows, like objects in a museum display case. What he handed me was a metal sign he had rescued from one of the demolished gasworks structures. 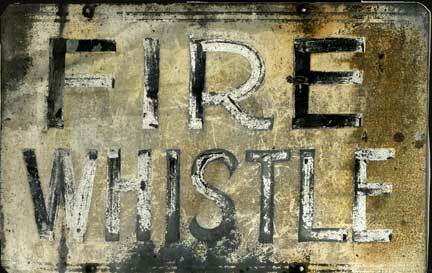 It reads “FIRE WHISTLE” and originally hung next to an alarm used during the gasworks’ not infrequent fire emergencies. Richard chose well when I asked him to bring me something that would symbolize the gasworks. The words on the sign and it’s corroded appearance speak volumes about the toxic, explosive business of making gas from coal. My biggest ongoing effort right now is getting material for a chapter on the Native American presence on Lake Union. I contacted a descendant of Cheshiahud, the last member of the Duwamish tribe to live on the Lake, and she tentatively agreed to do a video interview next month. I’m also hoping to find a Native person to do a short video about what life was like on the lake before the coming of white settlers. I’d love to have this video narrated in Lushootsheet, the traditional language of the local tribes, with English subtitles. There are barely any people who still speak this language, however, so it will be very exciting if I can actually accomplish this. Cheshiahud was a canoe carver and often guided canoe trips on the lake, so I’m also going to try to get some modern footage of a Native person paddling a traditional canoe on Lake Union, to help illustrate Cheshiahud’s story.